Silvio Danailov, the manager of the ex World Champion Veselin Topalov, gave an extensive interview for Radio Gong. Chessdom.com brings you exclusively the translation of the interview. Note that the English translation is of the audio version, as it includes more details and important nuances, that are omitted or wrongfully transcribed in the text version. Mr. Danailov, is the calendar year over for Veselin Topalov? Yes, the games in Novi Sad were the last of Topalov for this year, from now on we concentrate on Topalov’s preparation for the match with Anand. Topalov is first in the FIDE rating list. This is our goal since the World Championship title in 2005, Topalov to be number one at the FIDE rating list and at the same time. The first is already achieved and now we have to aim at the WCC match in Sofia. Magnus Carlsen is second only 9 points behind Topalov, Anand is third. Any surprises for you in top 3? Since Carlsen started working with Kasparov, he is progressing as expected. At this moment he has to deal with the psychological pressure to be only 9 points from the top. He is young and talanted, it is expected for him to become number 1 at some point. Regarding Anand, he is resting on his past success. He is almost not playing now. Let’s not forget he is 40 years old now and it is difficult for him to keep the pace of the younger players. At his age there is not much energy and he is reserving it. The main thing for him is to keep the title, as it gives him privileges. There is more than half an year to the match, do you expect “blows below the waist”? I suppose that in the next six months from Anand’s team will make everything possible to require unfulfillable conditions during the negotiations for the contract for the match, in order to make us nervous. They believe the match is more important to us, but in any case the match will take place and no matter what they do, they missed their chance. They could make a bid for India, which to be better than ours. For sure there will be caprises from their side. We have gone, however, through Elista, where it was much more difficult, so we are ready. The dates for the match are 5th to 24th of April Sofia? The dates are not sure yet, 5th to 24th of April is the desire of FIDE because Kirsan Ilymzhinov’s birthday is April 5th, and the the President of FIDE wouldlike his birthday to coincide with the start of the match. However, as far as I know, Anand has already requested a change of date for the end of April. FIDE will try to convince him for the initial dates, but anyhow it does not matter. If Anand is firm in his position and does not want to give in, the match can also start in the end of April. Ilymzhinov likes Bulgaria, several times an year he visits Vanga’s grave and draws energy from there. I expect the final date to be announced during the coming visit of Kirsan Ilymzhinov in Bulgaria in December (the date is still to be confirmed), which is for the signing of the contract and a meeting with the Prime Minister Boiko Borisov. What are the plans for Topalov’s preparation? Currently we are selecting coaches and seconds for Topalov. After that we will have training sessions in Spain, they will be in November, December, and January. As he needs practice, for sure he will participate in the Linares 2010 tournament from 13th to 25th of February. There is a theoretical chance that he participates in Monte Carlo as well, but that depends on the dates of the match with Anand. There will be new names in Topalov’s camp, for now I will keep them secret. It is always good to have motivated people and new ideas, We will have a doctor, psychologist, nutritionist, fitnes instructor. 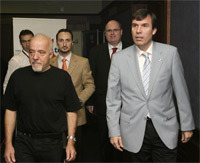 Of course there will be 7 to 10 days rest between the sessions, we will send him to the Canary Islands to regain energy. What is the role of the nutritionist? The nutritionist makes a special selection of food and a diet for Topalov. Some foods cannot be mixed, and so on. Such diet begins at least two months before the competition. This is in all sports, not just in chess. Before chess was considered to be only mental sport, but it turns out that without serrious physical preparation it is difficult to endure a whole game. In a match like the World championship every detailcounts. Currently you are in Spain, how do you evaluate the performance of the team at the ETCC in Novi Sad? It is a bad performance, the chess team resembles the soccer one, we have one or two good players, and we need at least five. I will rely on Kiprian Berbatov for the future, we had desire to include him in the team, but decided suchstep is premature. Cheparinov is also not in good form, if Cheparinov, Topalov, and Beebatov play next year we have more chances, but unfortunatelly that is what we have for now, the people that participated do not have the needed class for something more serious. Topalov has always played for Bulgaria, always with good scores. However, before we had chances for medals, now most teams gained speed, and when there are no chances for medals he is less motivated. In any case he always defends the honor of Bulgaria.